While the slopes surrounding Salt Lake City provide world-class skiing and snowboarding, whisking down the mountain is just the beginning of the fun you can have in the powder or at the resorts during the Utah winter. Whether you don’t ski or just want a break during a ski day, here are some highlights for non-ski activities, from the mountains to the city, from the snow to the ice. For a more controlled ride down the slopes, check out the Alpine Coaster at Park City Mountain Resort (1345 Lowell Ave., Park City, 435-649-8111, ParkCityMountain.com). The slide track takes you down the mountain along 4,000 feet of curves, bends and loops. Zip down the mountain—above the powder, in this case—with Canyons Resort’s new Zip Tour Adventure (4000 Canyons Resort Drive, Park City, 435-615-3449, CanyonsResort.com). Start with the demo tour, move on to the Red Pine Zip Tour, which runs 800 feet through the treetops, and then go more than 2,000 feet across the canyon on the Lookout Zip Tour. The tour ends where it starts. Even if you don’t ski, you can still take part in one of the best times of a ski day: aprÃ¨s ski. There’s even a place where you can get a sense of being out in the elements and experiencing the ice and snow while nibbling on warm snacks. The Waldorf Astoria (2100 Frostwood Drive, 435-647-5500, ParkCityWaldorfAstoria.com) at Canyons Resort premiered the Ice Lounge at Powder during the 2012 ski season, and it returns this year. Guests are provided with blankets to sit at a 14-foot bar made of carved ice—complete with sculpted ice furniture—while sipping on chilled Champagne. One way to move through snow is to allow gravity to carry you down the slopes. Another is to let the motor of a snowmobile propel you along. The Deer Valley-operated Summit Meadows Adventures (Browns Canyon Road, 888-896-7669, DeerValley.com) has more than 7,000 acres set aside for snowmobiling just five miles (about a 10-minute drive) outside of downtown Park City. Helmets are provided, and you can also rent all the gear you’ll need, like snowsuits, boots and gloves. Learn the sport of curling at the Utah Olympic Oval’s Learn-to-Curl program (5662 S. Cougar Lane, Kearns, 801-968-6825, UtahOlympicLegacy.com). The two-hour classes held on Monday and Friday nights are run by USA Curling and are limited to 50 people. Equipment is provided, and once you’ve taken the class, you can graduate to Cosmic Curling Night on Saturdays, where black light and neon help to light up the dividers and stones for a whole new curling experience. Are ya list’nin’? There’s nothing like a ride under the stars in a horse-pulled sleigh. A 30-minute ride leaving from near Ski Beach at Canyons Resort (4000 Canyons Resort Drive, Park City, reservations 888-464-3111, CanyonsResort.com) and going through Willow Draw starts at dusk and is offered twice more through the evening. If you’re looking for something a little more private or romantic, ask about the Vi-Sa-Vi sleigh that holds five or fewer passengers. You don’t have to go to Sochi, Russia, to participate in Winter Olympic sports. One of the legacies of holding the games here in 2002 was the Utah Olympic Park (3419 Olympic Parkway, Park City, reservations 435-658-4206, UtahOlympicLegacy.com), where you can travel at high speeds while trying the bobsled and skeleton. Professional pilots take three guests on the Comet Bobsled Ride, traveling up to 80 mph on a 15-turn course. If you’d rather go solo, they’ll teach you how to steer a skeleton (that’s the one where you lie down head-first), through a four-curve course where you hit speeds of up to 50 mph. For those who would like to see what it’s like to be on skis without having to worry about falling down a mountain or buying a lift pass, try Nordic (cross-country) skiing at Snowbasin Resort (3925 E. Snowbasin Road, Huntsville, 801-437-5488, Snowbasin.com). You can rent all the equipment at the resort’s Grizzly Center, and there’s no charge to use any of the 26 kilometers of the resort’s machine-groomed Nordic trails, which include options for beginners. Bear Lake (800-448-2327, BearLake.org) in northern Utah is a famous fishing destination in the summer because it has four species of fish that cannot be found anywhere else in the world, including the Bonneville cisco. You can go after those same fish during the winter on a day of ice-fishing. Instead of sitting in a boat using a rod and reel, you stand on the ice and dip a net down through a hole to “jig” for trout and whitefish along the Utah-Idaho border. There’s nothing that makes you feel like you’re living in the city like skating at a downtown rink surrounded by skyscrapers. Whether you live in Salt Lake City or the suburbs, head to the ice rink at The Gallivan Center (239 S. Main, 801-535-6110, TheGallivanCenter.com), which is open every day, and until midnight on Fridays and Saturdays through Feb. 23. Rent some skates, or bring your own and they’ll sharpen them for you. When you’re done, grab some hot chocolate at the concession stand. If you’d rather skate indoors under Utah’s largest mirrored disco ball, hit the Olympic Oval (5662 S. Cougar Lane, Kearns, 801-968-6825, UtahOlympicLegacy.com) on Saturday nights from 10 p.m. to midnight for Cosmic Skating Night, complete with black lights, neon, lasers and a live DJ. Learn about the history of Park City and some former residents who can’t seem to leave the place behind during Park City Ghost Tours (415 Main, Park City, reservations 435-615-7673, ParkCityghostTours.com). You can learn about ghosts such as Lizzy, who is still sometimes seen at the Imperial Hotel, or a miner whose favorite place in life was the Alamo Bar—and still is in death. The experience will give you chills and challenge you to consider whether or not you believe in ghosts. The tours leave every night at 7 from Miner’s Park, but reservations are required 24 hours in advance. 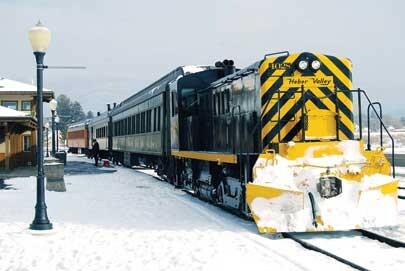 The Heber Valley Railroad (450 S. 600 West, Heber City, 435-654-5601, HeberValleyRR.org) has two trains that continue to run through the winter. The Lakeside Limited is a two-hour trip going “over the river and through the woods,” so to speak, along the shores of Deer Creek Reservoir and the base of Mount Timpanogos. The Deer Creek Express is a 90-minute trip that goes out to Decker Bay and back, with plenty of opportunities to see wildlife along the way. 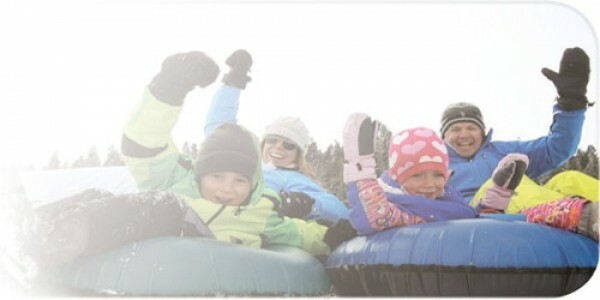 The perfect place to take kids for a variety of winter activities is Gorgoza Park (3863 W. Kilby Road, Park City, 435-658-2648, Gorgoza.com), located just off of Interstate 80 on the way to Park City from Salt Lake City. There are seven tubing lanes that let you speed down the hill, and towropes to pull you back up. There’s also an area for mini snowmobiles, and the littlest ones will enjoy the rides at Fort Frosty. Another tubing opportunity is at Snowbasin Resort (3925 E. Snowbasin Road, Huntsville, 801-437-5488, Snowbasin.com), where the four tubing lanes are in the same finish line area where the downhill ski racers competed at the 2002 Olympics. It’s a nearly two-hour drive from Salt Lake City to get to the Hardware Ranch Wildlife Management Area just outside of Hyrum (435-753-6206, Wildlife.Utah.gov/HardwareRanch), but once there, you can take a sleigh ride that runs out amid the elk herds that settle in this protected area. The rides run Fridays through Mondays during the daylight. If you love horses, you can volunteer to help hitch up and take care of the horses for a day—no experience necessary. • Welcome to the Neighborhood(s)!